The genus name Marrubium is thought to be derived from marrob, the Hebrew word for "bitter juice" and others believe it is from Maria urbs, a town in ancient Italy. The species name, vulgare, is Latin for "common." The common name horehound derives from the Old English har hune, "downy plant," in reference to the plant's hoary appearance. Horehound is a perennial native to Europe, Asia, and northern Africa. It grows to about 20 inches in height and is covered with downy hairs. The plant has four-sided stems and opposite, ovate, rugose leaves. The small, white, two-lipped flowers occur in dense whorls. Unlike most other mints, it has little aroma. 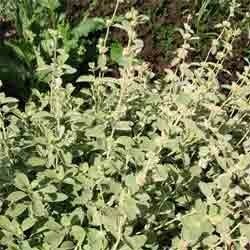 In the garden, horehound will tolerate poor soil and prefers dry conditions and full sun. It attracts bees and repels flies. Horehound has been used medicinally since ancient times. Julius Caesar recommended it as an antidote to poisons, while seventeenth-century English herbalists recommended it to help expel the placenta after childbirth. Early European settlers brought the plant to the New World, where it quickly naturalized and found use among Native Americans; the Navajo, for example, used it to ease childbirth. Horehound mildly stimulates cardiopulmonary activity, encourages the body to expel phlegm, clears heat and toxins, and deters infection. The essential oils in horehound help dilate the arteries and relieve lung congestion. Horehound tea is used to treat anemia, amenorrhea, asthma, bronchitis, catarrh, colds, congestion, coughs, croup, dyspepsia, dyspnea, heart palpitations, hepatitis, hoarseness, jaundice, laryngitis, pharyngitis, placenta retention, pneumonia, rheumatism, sore throat, tuberculosis, typhoid, whooping cough, and worms. Infused in oil, horehound helps heal wounds. It also can be prepared as a compress to treat dog bites, eczema, shingles, and wounds. Horehound, though having a bitter flavor, has long been a popular ingredient in candy, lozenges, syrups, and liqueurs. It is also sometimes an ingredient in beer, where it takes the place of hops. Horehound is believed to be one of the original bitter herbs of the Jewish Passover tradition. The fresh leaves of the plant can be immersed in milk and set out to kill flies. Horehound is considered very safe, even for children. It should be avoided during pregnancy, however. Large doses may be laxative and cathartic. The juice of the fresh plant may cause dermatitis.